My Austin office is in High Point Professional Park, which is conveniently located in the Arboretum area near the intersections of Capital of Texas Hwy, Hwy 183, and Mopac. 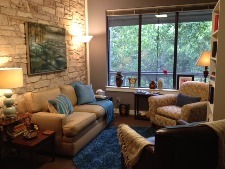 The stone building is tucked away just off Hwy 360 in a serene, calming, garden-like landscape with a greenbelt behind. 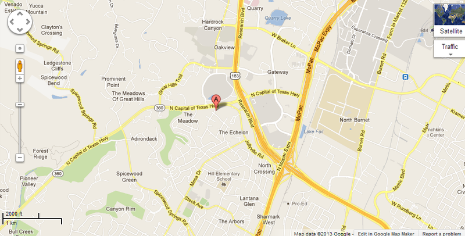 Take Mopac to Capital of Texas Hwy. West of Hwy 183, get into the left lane immediately and take the first left onto Wildridge Drive; it is not at a light. The complex is immediately on the left. If you go past the turn, continue down to the light at Great Hills Trail and make a u-turn then take your second right onto Wildridge Drive. Take 183 and exit onto Capital of Texas Hwy, go west onto 360 and get into left lane immediately and take the first left onto Wildridge Drive. It is not at a light. The complex is immediately on the left. If you go past the turn, continue down to the light at Great Hills Trail and make a u-turn then take your second right onto Wildridge Drive. Take Capital of Texas Hwy north. Continue past the light at Great Hills Trail. Then turn right onto the second street on the right, Wildridge Drive. The complex is immediately on the left. My Round Rock office is in the Sam Bass Market Center, which is conveniently located near Interstate 35, Hwy 79, and Hwy 620 in Round Rock. I office with other counselors there in a center called Passages to Potential. 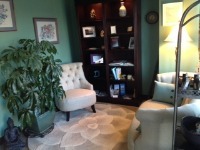 It is a calm, serene space with a yoga studio in the back of the office suite. Take exit 253 US 79 (Hutto/Taylor) exit and turn right at Sam Bass Road. Head west for approximately 1/3 mile. The office is on your right past the railroad tracks. We are located in Building Three at Suite 306. Take exit 253 US 79 (Hutto/Taylor) exit and turn left at Sam Bass Road. Head west for approximately 1/3 mile. 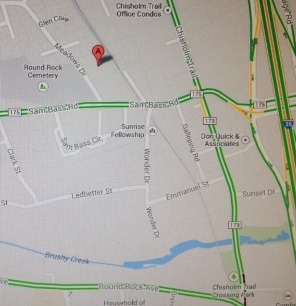 The office is on your right past the railroad tracks. We are located in Building Three at Suite 306.